Quesadillas are the best kind of comfort food, but if you’re sick of settling for soggy microwaved quesadillas, then you’re in the right place. With the help of your little toaster oven, you can enjoy a crispy flaky flour tortilla that’s oozing with melty gooey cheese. Stuff your toaster oven quesadilla with all kinds of goodies like roasted veggies and black beans to create a filling meal for two. It’s so easy! 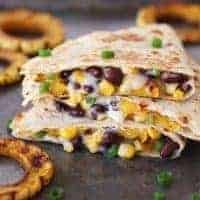 While a simple 2-ingredient (cheese and tortilla) treat is always nice, the star of these quesadillas is the roasted delicata squash. 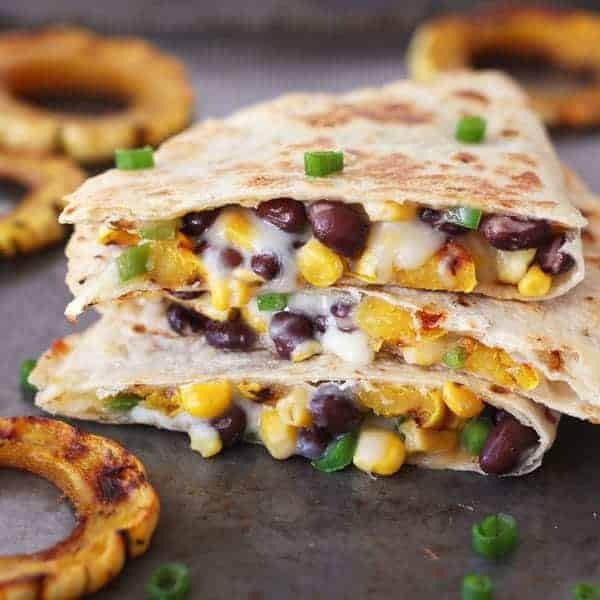 The seasoned squash slices give the quesadilla a nice sweet and smoky flavor. I love to use squash in this recipe but you can replace it with a batch of roasted sweet potato rounds, broiled zucchini or roasted broccoli. 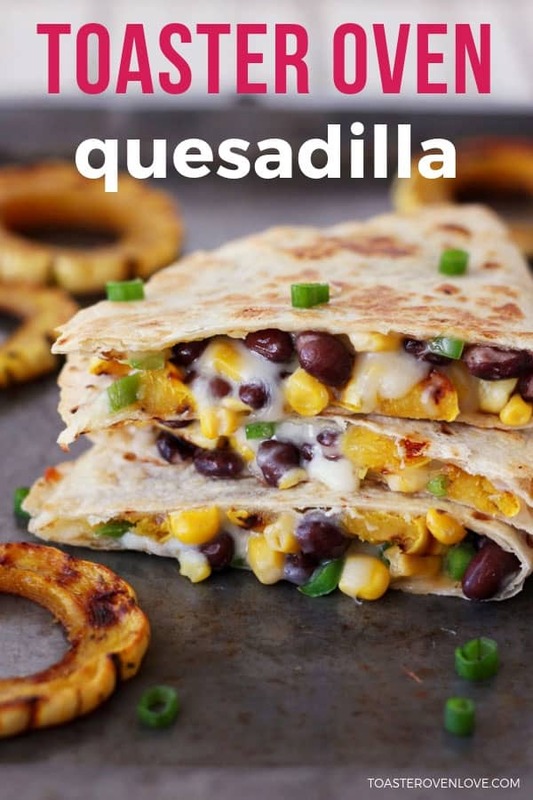 They all taste great in a cheesy quesadilla. 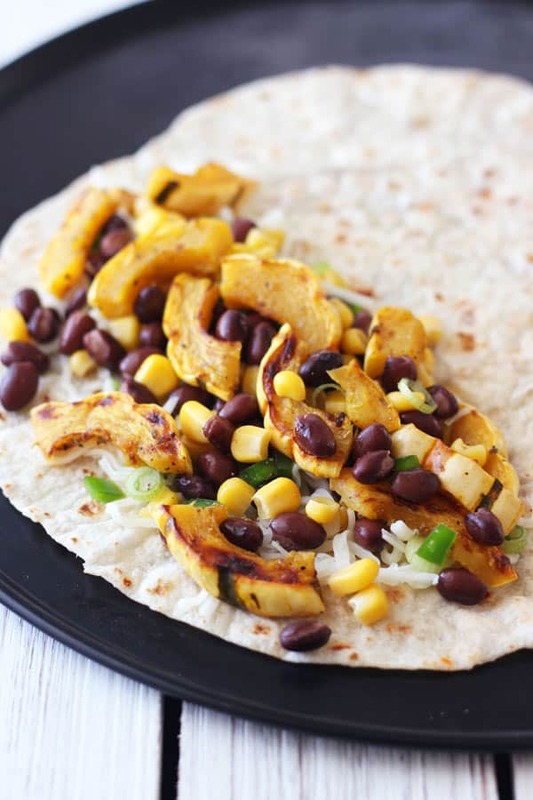 Add a handful of hearty black beans, sweet canned corn, some diced jalapeno, sprinkle of crisp green onions, shredded cheese and you’ve got yourself a seriously tasty and filling meal! Classic comfort food with a healthy-ish fall twist. 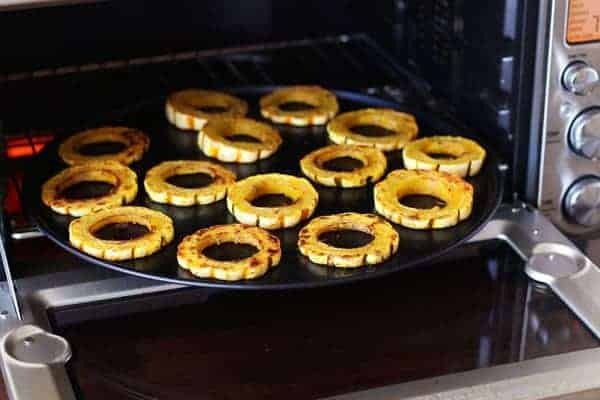 Adjust your toaster oven’s cooking rack to the bottom placement and preheat to 425 F. Oil a metal pizza pan or roasting pan with 1/2 teaspoon of the oil. Place squash slices in a large bowl and mix with cumin, oregano, garlic powder, salt, pepper and remaining 1 teaspoon oil. Arrange slices in an even layer on the prepared pan. Cook until softened and browned, about 15 minutes, flipping halfway through cooking. Remove squash but leave the toaster oven turned on at 425F. Roughly chop the cooked squash into pieces and add it to a large bowl along with the beans, corn, green onion, and jalapeño. Lightly brush one side of each tortilla with oil and place them oiled side down on your pizza or roasting pan. Arrange half of the filling on one side of each tortilla, sprinkle each half with the cheese and fold tortillas over the filling, pressing gently. Cook for 5 to 7 minutes in the toaster oven until the tortilla is crisped and the cheese is melted. Slice and serve warm. Adjust the cooking rack in your toaster oven to the middle or bottom placement and preheat to 425°F. Now, if you’re making a simple cheese-only quesadilla skip ahead to step 3. Roughly chop any roasted vegetables your using and add them to a bowl along with whatever else you want to include. Lightly brush one side of each tortilla with oil and place them oiled side down on a cutting board. Arrange half of the filling on one side of each tortilla, then sprinkle each half with the cheese and fold tortillas over the filling, pressing gently. Small Toaster Ovens: If you’re cooking with a little toaster oven like our Oster, you’ll need to cook the quesadillas one at a time. Since our roasting pan is so tiny, we like to place the quesadilla directly on the toaster oven’s cooking rack. 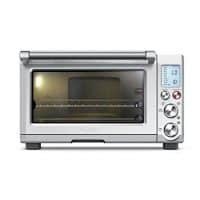 Large Toaster Ovens: If you’re cooking with a bigger toaster oven like our Breville Smart Oven Pro a pizza pan works great. Fill and fold your quesadillas, then place them back to back on the pan. Cook for 5 to 7 minutes in the toaster oven until the tortilla is crisped and the cheese is melted. Let the quesadillas cool for a few minutes before slicing and serving warm with sour cream, plain Greek yogurt, salsa or guacamole. This looks delicious. I love delicata squash and squash is just now coming into market here in Minnesota. I look forward to trying this soon.